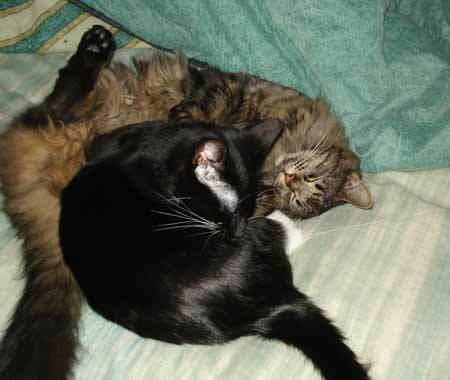 Al and Danielle adopted Petey (tuxedo) and Tessie (long haired) in November of 2004. "They are sisters although you'd never know by looking at them. We've since moved to Rhode Island and they seem to be loving the Ocean State. They both have such unique personalities and we love them so much. they have brought such joy to our lives. "Tessie must have known we were the ones for her right away because she has been sleeping sprawled out on her back, paws and legs extended, since she was a kitten. She is also the mother figure, she's always tackling Petey to give her a bath. Petey keeps more to herself, but she's a mama's girl. She loves to come up to sleep next to my head and her little motor is so loud it wakes Al up! She loves to give kisses by head butting and Tessie loves to give little massages. I call it making muffins because it looks like she's kneading dough. They are inseparable though and we often find them sleeping curled up together. We love them and couldn't imagine life without them now. Thank you so much Kitty Angels for bringing them into our lives." 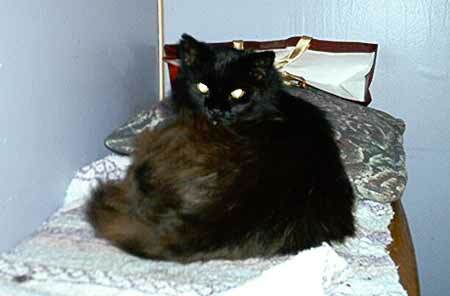 Steven sends us this picture of Lucky Cat and writes, "Lucky Cat eas adopted in December 2006. He just had his first visit to my vet and he's in good shape although he's still a bit on the chubby side at seventeen pounds. Lucky lives like a king with plenty of attention and with two other cats for playmates. It took a bit of patience as he spent the first half of the winter in hiding. But he's since learned that he's in good hands and he has now become well accustomed to his forever home. Lucky says: "Thank you Kitty Angels for finding a good owner for me. Please tell him I want tuna every day and not just once a week." Steven also writes, "Smokey was adopted from Kitty Angels back in 2004 and is somewhere around fourteen years old according to the vet. He shares a home with a much younger Lucky (above), and five year old Cookie. "Although Smokey is starting to show a lot of gray, he is in pretty good shape and has a healthy appetite. He's the alpha cat of the house, and even if he's not the first to get to a freshly filled food bowl, the other two cats know enough to retreat for a bit when he arrives. He has a handsome coat with a bushy tail and loves to show off whenever we have a visitor. "His favorite pastime is moving from window to window during the day to catch sunbeams for napping, and the furniture has been rearranged to provide him with towel covered perches. At night time, he earns his keep by being an excellent bed warmer. mokey says: "Thank you Kitty Angels for rescuing me from the Lowell alleyways and finding a home for me. 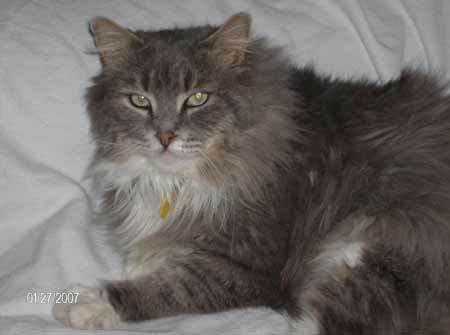 I hope that you can find lots of people like my owner who understand that a senior cat can often be the perfect addition to a caring household." 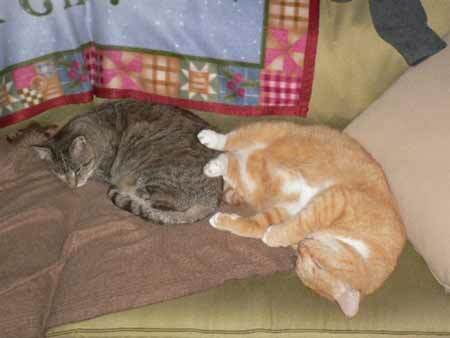 Heather writes, "I just wanted to say thank you for our two wonderful kitties! While they are so very different they are absolutely inseparable. Douglas (our first addition) is more reserved and a momma's boy; while Winston (formerly Linden) jumps in to everything paws first. Even our guests are amazed that cats can be so loving and affectionate. "As you can see they have very quickly made themselves at home. Thanks again for everything and for the help with Winston. He knows he has his forever home and no longer feels the need to 'lick' his fur off. That and Douglas has taken over the caring role, so I am not sure if he even has to groom himself!" 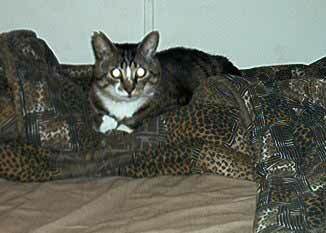 Lynne writes, "Coyote (age 3) became part of our family on January 13, 2007. We love him very much! Since he is not allowed to go outside, he loves to sit by the slider and watch the chipmunks, squirrels, cats and birds on our back deck and in the woods. When he sees a chipmunk, his tail thumps up and down! If he sees a cat, he gets in a 'pounce' stance and then runs and slides across the kitchen floor! He is so funny! "Coyote loves to be held and patted. Sometimes when we read, he climbs right on top of the book we are reading. He loves to wake up his 'mommy' (Michaela, age 10) every morning, which is awesome because Michaela is not a morning person! But when he wakes her up, she always gets up in a good mood! He also loves his 'Aunty Brittany', Michaela's best friend and 'sister'. Coyote does meow a lot, but we have learned to accept that this his way of telling us that he wants to be held. He has a very nice disposition and never scratches us!" "We consider ourselves the luckiest family in the world because Coyote chose us that day at Kitty Angels!"